As August fades into September, General Washington is feeling pretty upbeat about how things are going. At least one delegate believes that they will be done “i9n three weeks time.” Others aren’t so ready to finish things without getting their say. Every attempt to resolve the matter of the Presidency is met with an objection and a move to delay. Soon enough, the Committee on Postponed Parts will have their hands full trying to resolve everything that has been postponed. In the meanwhile, the Convention seems to, for the first time, consider why a new form of Government is needed, beyond the Randolph outline of so many weeks ago. 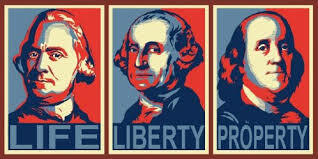 The principles that underlie the nation are Life, Liberty, and Property. There is a general realization that a stronger central government is the best guarantee of those. watching what is happening in Rhode Island has convinced them that left to themselves, the States will not provide those protections. With that in mind, the Delegates take up the Judiciary and the power of the States over commerce, money, and contracts. They believe that the federal Governments control of these items, among others, will provide the best guarantee of Life, Liberty, and Property. Posted on August 27, 2015, in Dave, Podcast, The Convention and tagged Article III, Commerce, Constitution, Constitution Thursday, Convention, Judiciary, Podcast, Rhode Island. Bookmark the permalink. Leave a comment.